Given the delays launching the year's first Atlas 5 rocket due to high-altitude winds and scheduling conflicts with a Navy submarine missile test off Cape Canaveral, the next Atlas mission is moving out a week or so as a result. A spokesperson for the Air Force's Space and Missile Systems Center confirmed the targeted April 27 Launch date will slide into early May. But the exact date depends on avoiding another schedule conflict on the Eastern Range at the Cape, which is booked for the planned April 30 blastoff of the SpaceX Falcon 9 rocket and Dragon cargo vessel on the first private spacecraft launch to the International Space Station. That mission has its primary and backup attempts reserved on the Range, pushing the Atlas to May 5. But if the Falcon goes on time or experiences a lengthy delay in advance, the Atlas will be postured to leap forward a couple of days to fly as soon as around May 3. The Air Force-run Range provides all of the critical and necessary tracking, communications and safety services for Cape Canaveral rocket launches. It needs time between missions to reset equipment to support the next vehicle in the queue. Realigning the Atlas target date will ensure ample time for assembling and preparing the massive 19-story rocket for flight, as well as building slack back into the overall schedule. "The new launch date was not the cause of any problem, but rather ensuring there was adequate time between launches as well as adequate time required to prepare/process for the launch," the SMC spokesperson said. A launch on May 5 would be possible during a two-hour window opening at 2:38 p.m EDT (1838 GMT). 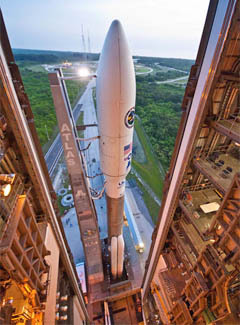 The Atlas launch on Feb. 24 hauled the first in a new-generation of mobile communications spacecraft into orbit for the Navy. The upcoming mission will deploy the second satellite for the Air Force's new Advanced Extremely High Frequency system for ultra secure, top priority communications between the president and military brass. The Atlas fleet has a busy 2012 on tap, with a classified satellite-deployment in mid-June for the U.S. National Reconnaissance Office, another NRO mission from the West Coast at Vandenberg Air Force Base in early August, dispatching NASA's Radiation Belt Storm Probes at the end of August from the Cape, reflight of the Air Force's first X-37B reusable spaceplane in October and sending up a fresh Tracking and Data Relay Satellite for NASA before Christmas.